Our product range includes a wide range of Everest Three & Four Core Heavy Duty Flexible Cables and 3 Core & 4 Core Round Cables. Everest 3 Core & 4 Core Round Cables are manufactured for critical space requirement, protection against indefinite immersion in water under specified conditions, protection against rain water and ingress of small, solid foreign bodies. 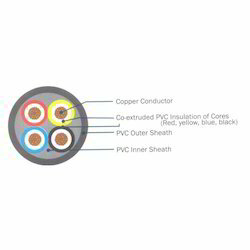 Everest 3 Core & 4 Core Round Cables are produced from best quality electrolytic copper which is drawn, annealed on-line and bunched on automatic machines to ensure flexibility and uniform resistance. The conductors are insulated with a special grade of PVC on sophisticated co-extrusion lines. Outer sheath consists of highly abrasion resistance PVC compound impervious to grease, oil and water, etc. 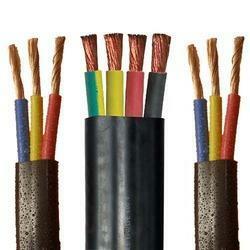 Looking for Three & Four Core Heavy Duty Flexible Cables ?